1. Put a large saucepan of water on to boil ready for the spaghetti later on. 2. Put a tiny splash of oil into a pan on a high heat and add the mince. You only need a small amount of oil hear as plenty of fat will come out of the meat so you don’t want to drown it in too much fat. Season generously with salt and pepper. 3. Break up the mince as it cooks and cook until all the meat is lightly browned. 4. At this point remove the meat from the pan with a slotted spoon, leaving the meat juices in the pan. Set the mince aside and cover with foil. 5. Lower the pan to a medium heat and add the onions, garlic, carrots and celery. Cook these in the meat juices, no need to add extra oil. Gently fry until onions are golden and the carrots have softened. 6. Add the meat back into the pan, stir in the tomato purée and crumble in the stock cube. Add the red wine and simmer for approximately 3-4 minutes. 7. Add the chopped tomatoes, mushrooms and dried oregano, mix together and bring to the boil. 8. As soon as the sauce starts to boil turn the heat right down low, season to taste, place a lid on the pan and leave to simmer while you cook the spaghetti. 9. 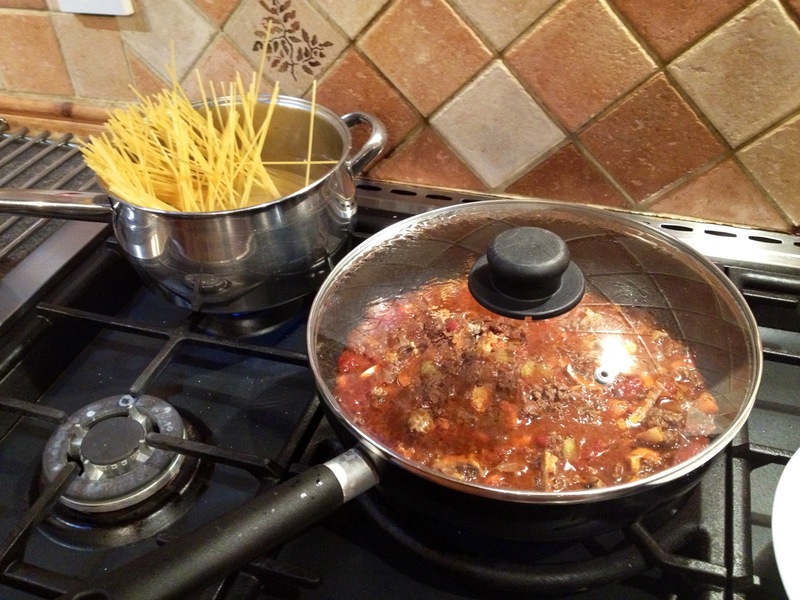 Add the spaghetti to the saucepan of boiling water you out on earlier and cook as per packet instructions. Taste the pasta to see if it’s cooked, it should be just al dente which means the pasta is soft but with a slight bite to it. 10. Drain the spaghetti when cooked and by this time your sauce will be ready. Remove the lid and stir in the fresh chopped basil. 11. Dish up and serve topped with plenty of freshly grated parmesan. It’s also nice to have some garlic bread on the side. Tip: If I’m feeling particularly indulgent, I also like to add some bacon or pancetta lardons, I would add these to the pan and fry with the vegetables. I hope this method works for you and you enjoy it as much as my friends, family and I do!